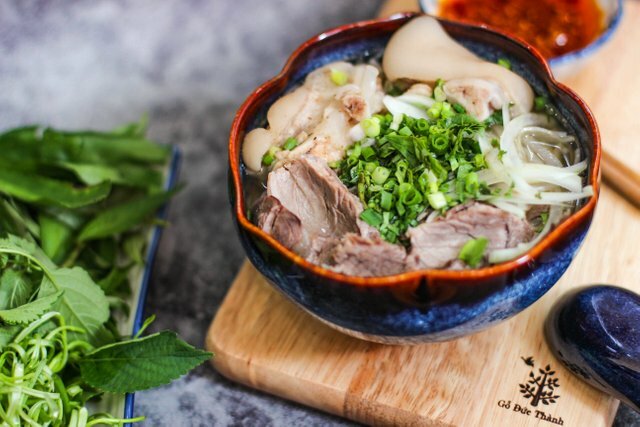 Hue style beef vermicelli soup recipe. 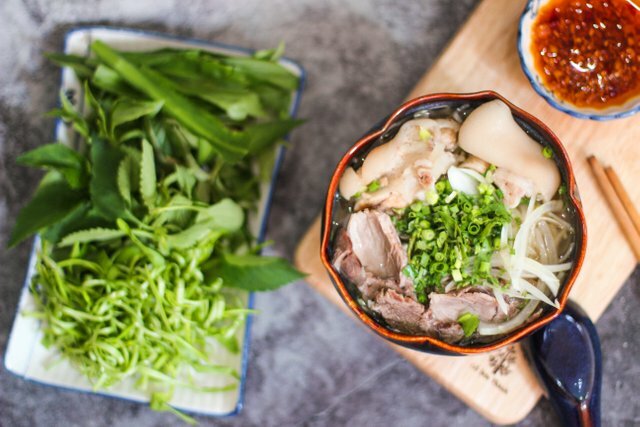 This dish is a popular Vietnamese soup contain rice vermicelli and beef. It originated in Hue-a former capital of Vietnam. This is a cooking style of the former royal court. With spicy, salt and sour flavour. 500 grams of beef shank. 500 grams of beef bone or pork marrow bone (cut into large pieces). 500 grams of beef brisket. 500 grams of pork shank (cut into large pieces). 4 lemongrass (finely chopped-divided into 2 parts). 2 lemongrass (cut into 2 inches). 2 shallots (finely chopped-divided into 2 parts). 2 cloves of garlic (finely chopped). 1 small onion (very thinly sliced). 4 tablespoons of fermented shrimp paste (stir well with 4 tablespoons of water-filter and keep the liquid). 2 tablespoons of cashew nut oil. Rice vermicelli or dried rice vermicelli. Green onion (thinly sliced), laska leaves (thinly sliced), culantro (very thinly sliced). For vegetables: Laska leaves, culantro, ramie leaf and water spinach (use steems only) and chilli (chopped). Salt, sugar, black pepper, chilli sauce, vegetable oil and fish sauce. Bring to cup of water, bring to a boil over high heat. When the water is boiling, add the beef bone, beef shank and beef brisket for about 2 minutes just clean it. Drain and rinse until water is clear. Marinade the beef brisket with sugar, salt, 1 part of shallot, 1 tablespoon of filtered shrimp paste liquid, 1 part of minced lemongrass, black pepper for about 2 hour. So the beef can soak up. In the large saucepan, add the beef bone, about 3 litres of cool water, beef shank, pork shank and simmer for about 2 hour. When the beef shank and pork shank are cooked. Take the the beef shank and pork shank out. Set aside to cool down at the room temperature. Then very thinly slice the beef shank and set aside. Take the beef bone out. Heat vegetable oil in the frying pan over medium heat, add lemongrass (cut into 2 inches), 1 part of shallot and fry well until fragrant. Then put the beef brisket and stir-fry well for 3 minutes. Put it into the bone broth which you are cooking. When the beef brisket is cooked. Take out and very thinly slice. Meanwhile, prepare the water spinach: cut the water spinach in halt, cut off the wilted part, and use the fresh part and rinse well. Then Very thinly slice the water spinach with a knife. Soak the water spinach in boiled cool water for about 20 minutes. Drain well and set aside. For dipping sauce: Heat cashew nut oil in a saucepan, add garlic and 1 part of lemongrass, stir-fry until golden. Then add chilli, fish sauce, salt, sugar and water. Stir well for a minutes. Set aside. About 10 minutes before serve. Add filtered shrimp paste liquid, black pepper, fish sauce, salt, chilli sauce into the bone broth (you are cooking) to taste. Arrange the vermicelli in the bases of deep serving bowls, add the beef shank, beef brisket and pork shank. Ladle over the broth, sprinkle green onion (thinly sliced), laska leaves (thinly sliced), culantro (very thinly sliced). Serve hot with all of the ingredients in vegetables and dipping sauce. If you using dried vermicelli: Bring a large pot of water to a boil, soak vermicelly, stiriing until softened, usually about 6 minutes. Drain and rinse with cool boiled water. First of all I have to congratulate with you forum your cooking post that are becoming vetreria and more descrittive about your recipes. In the second point I really like watching that in Vietnam you cook vermicelli: you use rice ones and we cook wheat vermicelli but I am dire that they are good both. I have tried them in Asia resturants and I liked them. YUMMY @anbpt ,nice recipe .Will try soon. I love soups and if it's meat.